We live in such a creative world and with enhancement of technology that creativity is being ultilized to create some impressive works on art in many forms. This is too the case in the architectural world which is reflected in the some of the incredibly unique hotels across the world. Below are some of the most unique hotels from across the globe! You’d think simply being a resort on a private island in the middle of the ocean would be enough! But it turns out in The Maldives competition is high. That’s why Nyama Private Island Resorts had to take it one step further and build the world’s first underwater nightclub. Subsix the self proclaimed Underwater playground sits 20 feet below the Indian Ocean. The dance floor, an illuminated ocean is only outdone by the windows which run the entire length from top to bottom. Niyama Private island empitamizes luxury travel with Niyamas Premium Villas huddling together in a crescent offshore amid turquoise waters each equipped with private butlers, chefs and housekeepers to make sure you can sit back and bathe in the absolutely paradise that is the Maldives. Marina Bays Sands is one incredibly unique hotel that stands out from the Singapore Skyline with its impressive skyscrapers. The eccentric design a ship placed on top of 3 large towers, Does it make sense? Properly not initially, but after a few Singapore Slings in the hotel’s flashy casino followed by the a dip in the perhaps the world’s coolest infinity pool offering guests the sublime sensation that is swimming into the Singapore skyline it doesn’t need to make sense. It just works! The designer Oshe Safide an Architectural genius. An exclusive boutique hotel located in the Langata suburb of Nairobi in Kenya, Giraffe manor offers the chance for guests to share dinner with a herd of wild giraffes. The hotel set amongst 140 acres of Wild African Forest welcomes the Giraffes every morning and evening. At these times as the Giraffes poke their heads through the windows in search for food they become the feature point in what is perhaps the ultimate instagram photo glorified by travel photographer Jack Morris on his instagram travel blog @doyoutravel. Outside of Japan, Capsule hotels are pretty unique. In Japan staying in Capsule hotel is an fact an interesting cultural experience offering something similar to sleeping in a washing machine. The difference is the capsule its slightly larger, you have your own little television usually inclusive of some X-rated Japanese Channels. Facilities include a large communal bathing area with large hot baths and communal area for relaxation occupied by Japanese businessmen. While Capsule hotels are common in Japan, Nagakin Capusle Hotel located in Shimbashi, Tokyo is special! The most famous of all capsule hotels, the unorthodox design was created by legendary Japanese Architect Kisho Kurokawa. The hotel is symbolic to Japan’s Post-War cultural movement and a rare example still visible in Tokyo’s streets. The building looks almost extra-terrestrial like which Capsules in the 14 story building sticking out from one another in a 3D tetris like formation. Remarkably the building was built in just 30 days in typical Japanese efficiency. 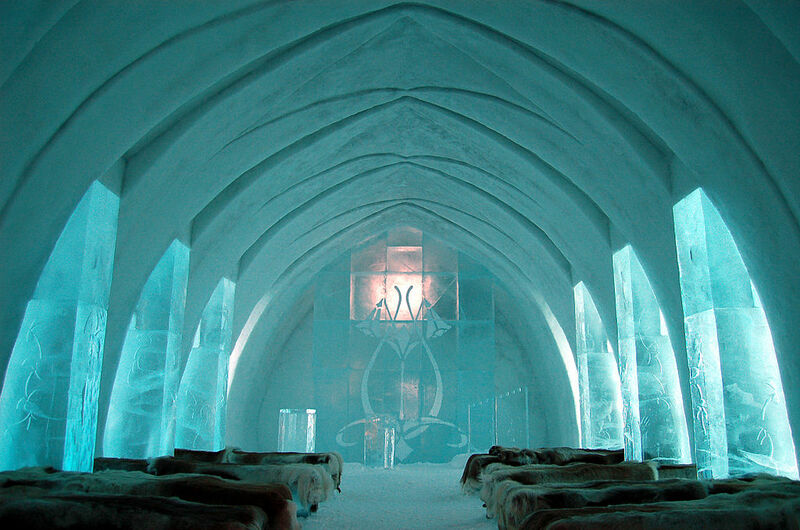 The original ice-hotel 200 km from the Arctic circle, it doesn’t get much ‘cooler’ than this. Founded in 1989 in the swedish village of Jukkasjärvi, Ice Hotel is rebuilt every winter by carving giant ice blocks into magnificent themed rooms. Each Suite comes with a different theme which can range from a Labrinyth to a tropical ice jungle is individually sculpted by hand. All furniture in the room are made from ice with guests sleeping on a ice bed. And are provided with thermal sleeping bags to prevent them freezing to death! © Copyright 2018 Hotels Tours. All Rights Reserved.